Random thoughts, words of encouragement, and challenging words from an ordinary man. ©2016 BillBodacious and Let's Ask Dad, Unauthorized use and/or duplication of this material without express and written permission from this site’s author and/or owner is strictly prohibited. 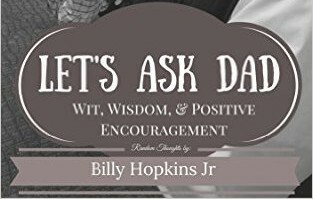 Excerpts and links may be used, provided that full and clear credit is given to Billy F. Hopkins Jr. and Let's Ask Dad with appropriate and specific direction to the original content. My dad always told me there are some things in life, if we just took a little time to think it through, we would be able to figure out on our own. Too often we focus more on our problems then we do the solutions. Other times we wallow in our pity, spending much more effort and time telling others about our situation then we spend climbing up out of the pit! There are plenty of times we face things that are out of our control. Disease, death, loss, trauma. Many of these life changing moments are completely out of our control. However, the way we work through even the worst of times is still based on a choice we make. It doesn’t take long, if we will, to look around and realize there are others living through a real crisis. Be thankful you aren’t experiencing those situations and begin counting your blessings Even the smallest of things should be considered as opportunity to be grateful. Why do we sometimes treat things that are not tragic as if they are the greatest crisis we could ever face? That’s where some “horse-sense” needs to kick in. We need to analyze the entire situation, determine what we can and cannot change, and then apply a little common sense to the situation. The “boy-who-cried-wolf” approach can often cause others to distance themselves and begin to question if help is needed or is this just another attention-seeking personal crisis. It is hard to maintain relationships that willingly create a continual crisis or over-exaggerate every problem that arises. Walking around sense, common sense, and good old fashioned horse sense comes with life and the experiences we live through. Those experiences often haven’t come cheap! As a matter of fact, all that sense and wisdom came with a large price-tag attached to it! Therefore, be sensical and don’t make everything out to be the current crisis. Use what you have learned in life to help others, and you can help others mount up on that good old fashioned horse-sense and ride off into an entire mountain range of hope! I'm just a common man with sometimes uncommon thoughts. I want to be the encourager, the mentor, and a coach to those who feel like giving up. I have been blessed with a quiver full of children and have gained much wisdom in the process of raising them. I am blessed to be married to the most amazing woman I know. She is everything to me and life wouldn't be the same without her. I count my blessings daily!